A few years back, like almost everyone we know, when the quarterly bills rolled in, it was a bit of a scramble to pull together the finances to cover those recurring household expenses. Things would get busy and before you know it, another 3 months had passed and another set of rates, water and electricity bills were arriving in the letter box… within 2 weeks of one another. Eeeeek! Then a conversation with a friend lead me to a new solution. We were talking about rising electricity costs and she said her electricity company allowed weekly contributions to her quarterly bills as a way to avoid the huge expense when billing rolled around. Brilliant! And being a big fan of automation, because I love anything that will simplify my life, I found a method that would work perfectly for us! I started paying our 3 quarterly bills weekly, by making an automated payment each week towards the billing account. Back when we started doing this, it was around $20-25 for each bill per week. We set up automatic payments for our electricity, water and property rates, which are each of our quarterly bills. It was set up to come out of the account the day after our pay went in (although being a work at home mum, there is only one regular pay going in now). Come quarterly bill time, because of our weekly bill pay method, we had very little left to pay on our household expenses. In some cases, we had nothing remaining on the bill and were in credit instead. This was a great feeling, since the smaller amounts coming out each week were not very noticeable as they were built into our budget of the amount that goes into our joint account for bills and home loan repayments (also automated). If we found we were getting really far ahead, we could skip a payment every now and again and have more left in the account for other bills or expenses. Or if our bill arrived and we were owing a fair bit still a few bills in a row, I simply increased the weekly amount to balance it out. These days we pay around $25 – 30 a week per bill, depending on which it is and we have very little left to pay at the end of the quarter. No more of those dreaded moments of getting all 3 at once and having to put them on the credit card until next pay. And a bonus tip – we do pay a little extra into our joint account each fortnight than what is needed for our home loan repayments. This means we have that extra bit of cash floating in there ready for when our dreaded home and contents bill arrives each August, or to help towards car insurance and rego. Although we should probably up it a little so these bills sting a little less each year too! 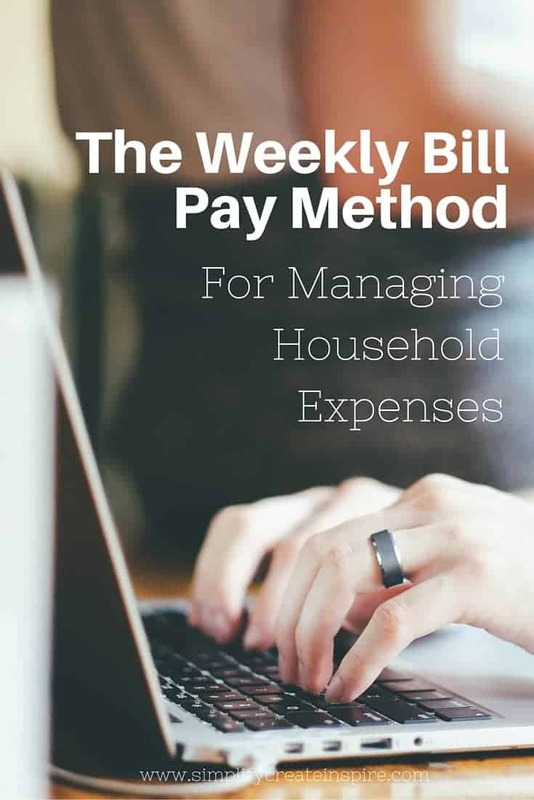 Do you have a weekly bill pay method in place or another great system to manage your household expenses? Share in the comments. We pay quite a few of our bills weekly and it’s such a relief to get those big bills and see you hardly have anything to pay or are in credit. Back in November I upped our electricity bill payments by $10 a week as I knew they would go up over the summer months thanks to the air con – which I use sparingly as I can just hear it costing me money!! That’s smart thinking for the summer electricity bill. I should have done the same as ours was up a bit, but still nothing drastic at least.